BigB, wearing the Homer Simpson-Che Guevara t-shirt we picked up for him in Buenos Aires. A Che image on a Bangkok tuk-tuk on Khao San Road. 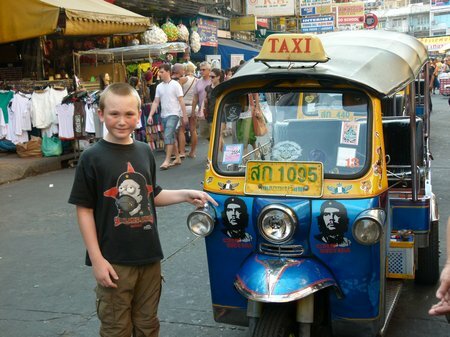 This entry was posted in Kid Travel Photos, Thailand and tagged Bangkok, Photo Friday, Thailand on February 3, 2011 by wandermom.